The grand capital city of Russia, seat of power and money – and previously the heart of the Soviet empire. The latter alone left enough of a legacy to make Moscow a prime destination for the dark tourist. But there are a few dark sites outside the Soviet context too. And modern Moscow in general is one of the greatest metropolises in the world, on a par with Paris, London, New York, and thus well worth exploring in depth. More background info: Moscow's history goes back hundreds of years. It first became established as a real power centre between the 13th and 15th centuries, when the Mongol Hordes were finally staved off, at the beginning of the reign of Ivan the Terrible. He gained that epithet on the home front, though, where his unstable nature and bitter personal unhappiness made him launch into a reign of terror – apparently he even killed his own eldest son. Destabilized Moscow then became the target of marauding Tartars and, following Ivan's and his successor's deaths, Moscow fell into Polish hands for a while until it was liberated again by Cossack armies and the long reign of the Romanovs began. In 1712 tsar Peter the Great moved the capital of Russia to his newly devised St Petersburg, sending Moscow into a long period of decline. Though now only playing the second fiddle politically, Moscow did however retain enough power and importance to be ready to bounce back at the beginning of the 19th century. In 1812 the Napoleonic armies pushed towards Moscow. The Battle of Borodino outside the city was one of the bloodiest ever, with 100,000 dead in just one day. Napoleon briefly entered Moscow, which had been half burned down (allegedly by its own citizens so as to deny Napoleon more booty). But exhausted and without any adequate supplies left, he retreated. It was disaster for the French. The troops succumbed en masse to starvation, cold, disease and Russian attacks and were chased all the way to Paris. Moscow was rebuilt and soon became a veritable a boom town and a major centre of the Industrial Revolution. Growth also included the population: by 1890 Moscow hit the 1 million inhabitants mark. However, the massive influx of peasants overwhelmed the city and social tensions increased. At the beginning of the 20th century tsarist rule was shaken as new political movements challenged it, leading to a first attempt at a revolution in 1905. It failed but Lenin is said to have described it as the “dress rehearsal” for the real thing twelve years later. Weakened by WW1, the tsarist rule did eventually collapse in 1917 with the revolution kicking off in St Petersburg. Lenin, now at the helm of the new Bolshevik leadership, ordered the reinstitution of Moscow as the capital city (partly for fears of foreign attacks – see also Mudyug) and he and and the emerging “more equal than others” ruling class moved there in 1918. However, the post-revolution Civil War in Russia took a heavy toll on Moscow, with the economy on its knees and disease and hunger causing an exodus of the working class population to the rural villages outside the city. After Lenin's death in 1924 (see Gorky Leninskiye), Stalin took over and began his first wave of purges. His iron-handed rule continued in the 1930s with both his Red Terror and, at the same time, a ruthless programme of industrialization and collectivization. In WWII, Moscow was nearly reached by the invading Nazi troops of Germany that had fought their way through the Soviet Union from 1941 leaving behind a trail of destruction and atrocities (see also Belarus and Ukraine). But their advance was halted just 20 miles (30k m) away from the Kremlin. Winter had caught out the Germans and now it was time for the Soviets to fight back (see also Volgograd). Thus Moscow was spared a Nazi invasion and instead it became Stalin's centre of command from which the Great Patriotic War was organized and eventually won in 1945 (see Karlshorst in Berlin). Stalin celebrated the victory in style with bombastic parades on Red Square. He was at the zenith of his power – a more than equal partner at the Potsdam Conference and later feared leader of the Cold-War Soviet military strengthening. Yet the God-like dictator was not immortal. After his death in 1953 an incredible display of mass mourning took place in Moscow with hundreds of thousands wanting to see the body of the little strong man lying in state. Yet only a few years later, the crimes during his rule were exposed and a process of de-Stalinization began. The rule of his successors Khrushchev and Brezhnev was characterized by the Cold War and the competition with the USA, both in the Space Race and in the nuclear armaments escalation, whose relevant industries had many of its development and production centres around Moscow. The city became very much the gravitational centre of the Soviet empire and thus a kind of boom town again. Architecturally this culminated in the building frenzy for the 1980s Moscow Olympics (the Hotel Cosmos is a prime example - see below). Yet cracks in the whole Soviet system were clearly beginning to show by the 1980s, and after Brezhnev's demise and his two successors' hasty follow-on deaths, the leadership of Gorbachev from 1985 brought perestroika and glasnost – but not the economic improvements the population longed for. When the Eastern European countries and Soviet Warsaw Pact countries underwent revolutionary change, culminating in the fall of the Berlin Wall in November 1989, the Soviet Union began to fall apart too. As more and more Soviet republics tried to break away (see e.g. Estonia, Lithuania, Latvia, Azerbaijan) and Gorbachev looked increasingly weakened, a group of army generals attempted the putsch of August 1991. Tanks were rolling through Moscow. Yet the population remained defiant and the soldiers proved less than keen to start massacring their own fellow citizens. In that situation Moscow's mayor Boris Yeltsin seized the moment. Climbing a tank and taking leadership of the resistance against the putsch, while Gorbachev was away, under arrest at his datcha, Yeltsin became the man of the hour and soon the putsch had failed. Before long Gorbachev was ousted and the Soviet Union dissolved. Just over two years later the honeymoon was over and Yeltsin himself came under attack after he had fallen out with parliament and was about to introduce drastic constitutional changes. 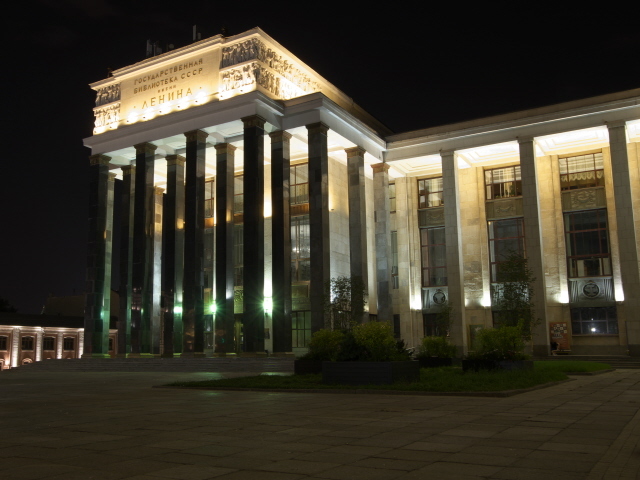 The situation escalated into violence and the White House – the city hall from which Yeltsin had emerged victorious in 1991 – came under fire, literally: it was shelled by tanks and partly burned out. This was accompanied by violent street fighting in which hundreds were killed and injured. Eventually Yeltsin consolidated his power. But the psychological scars of the 1993 constitutional crisis were to last for a long time. Since then, Moscow and Russia have got to their feet again in economic terms at least, though the new face of politics and economic leadership in Russia that Yeltsin had paved the way for and that his successor Vladimir Putin continues to preside over to this day have also led to much resentment amongst more libertarian opposition circles. And the post-communist developments have also brought poverty to many. Not everybody is a winner in this new political era. Far from it. Yet whatever you may think about Putin politically (and it's not a topic I am prepared to go into here), the accumulation of wealth in Moscow has become very visible indeed and changed the city and the society within it yet again – indeed beyond recognition (as I was able to confirm when in the summer of 2017 I returned to Moscow after an 18-year break … this time I was totally wowed by Moscow!). Today's Moscow is a giant metropolis – the largest in Europe, with a population of between 13 and 17 million and boasting one of the most powerful urban economies in the world. New business district skyscrapers have mushroomed, and large-scale infrastructure improvements were brought on their way. The new glitzy, proud and modern city has reached the top. And this is also reflected in tourism. Never has the tourist infrastructure been better in Moscow and with all the investment pouring in with a view to the 2018 Football World Cup in Russia, it's set to improve further. See also under access & costs below for more practical details. Dark tourism has also benefited from all this. Several new sights of interest to the dark tourist have joined Moscow's already rich portfolio in this respect. It really has become one of the world's most rewarding cities for tourists of this ilk. Do go! Red Square and the Kremlin at the very heart of Moscow – and most visitors will want to start their city explorations right here. That's just as well, as the Kremlin's towers are as iconic as it can get. And right in the middle of Red Square stands what is possibly the most iconic building of Russia at large: St Basil's Cathedral. And this uber-pretty onion-domed church has a dark element in its history too: legend has it that tsar Ivan the Terrible, who commissioned the church, blinded its architect after its completion so that he couldn't create anything as beautiful anywhere else. But that's probably just a fancy legend. Historical fact is, though, that Ivan had hundreds of people executed on Red Square (though not on the Place of Skulls circular raised platform that some legends erroneously identify as an execution site). Yet the name of the square derives not from the colour of blood, nor that of the square, but 'red' in Russian, “krasny”, also translates as 'beautiful' – and that's what's supposed to be in the name. Near Red Square are a few more icons of Moscow, e.g. the world-famous Bolshoi Theatre (meaning simply 'big theatre'), the Lubyanka, the Lenin Library (Biblioteka imeni Lenina) and the State Duma, the Russian Federation's parliament. The political centre of the city of Moscow, however, is further west: the so-called White House, the city hall. From here Boris Yeltsin took control at the time of the collapse of the USSR (see above). And it was also here that violent clashes took place in 1993 in the immediate post-Soviet chaos when the White House was shelled and partly set on fire (but those scars have long since been repaired). Opposite the White House stands one of the Seven Sisters. These skyscrapers are amongst the most iconic architectural manifestations of the Stalin era, flamboyantly distinctive in style, with neo-Gothic elements combined with structural features of the Empire State Building in New York, but with big Soviet symbolism too. To this day, these stone giants are adorned with hammer-and-sickles, red stars and socialist-realist reliefs and other Soviet artwork. Two of the Seven Sisters are now hotels that belong to big Western chains, including the one opposite the White House as well as the one at the bottom of Komsomolskaya Square, the Leningradskaya. The very largest of the Sisters is the main building of the Moscow State University. Others are still in government use, such as the Ministry of Foreign Affairs, yet others now house offices and/or private residential flats, e.g. the grand Kotelnicheskaya Embankment House. (Note that there is an “eighth sister” outside Russia, namely the Palace of Culture and Science in Warsaw, Poland!). While these grand architectural relics still dominate parts of the Moscow skyline and are visible from far away, the underground is also full of fantastic Soviet relics, namely in the form of the Moscow metro. Several stations are adorned with lavish socialist-realist mosaics, murals and statues as well as all manner of Soviet symbolism. You can even go on Soviet-themed guided tours of the metro. Amongst the best Soviet-style stations is Komsomolskaya – make sure you look up at the ceilings! In the photo gallery below is one prime example of a ceiling mosaic featuring Lenin delivering a fiery speech outside the Kremlin … and isn't that moustachioed man standing in the background suspiciously reminiscent of Stalin? Otherwise you don't really find depictions of Stalin any more, most were removed in the process of de-Stalinization in the late 1950s and early 1960s (but see Muzeon). Lenin, on the other hand, is still frequently encountered, also in the form of statues. 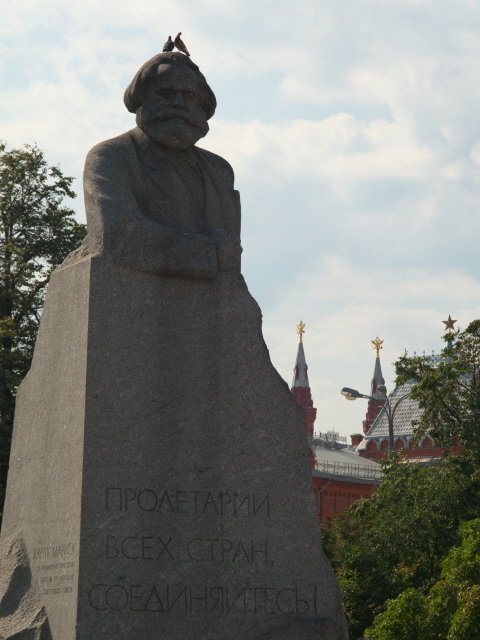 A prominent one stands outside Leningradsky station on Komsomolskaya Square. Busts of bushy-bearded Marx can also still be found. And sometimes you get the full triumvirate of Marx, Engels and Lenin. The relics of visual symbolism of the Soviet Union are so plentiful you could be misled into thinking that communism was still alive here. But of course it isn't. Moscow has long arrived in the capitalist First World – with its own special form of capitalism, that is, which also has its dark sides (gross inequality being just one of them). Evidence of contemporary dark aspects of Russia and its politics are rarely encountered out in the open by foreign visitors. 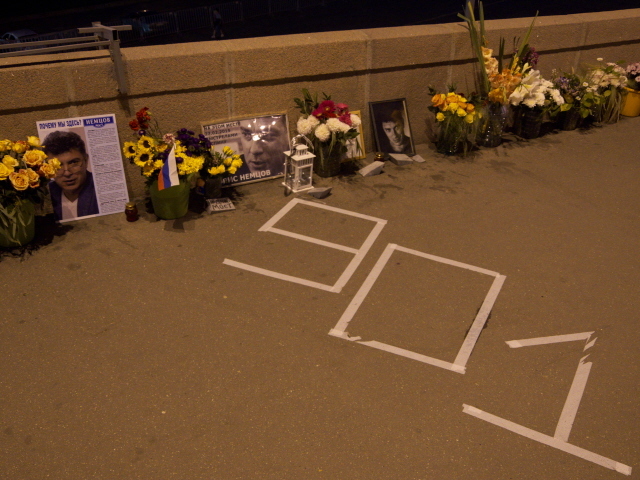 So it was an unexpected sight for me to find a little improvised shrine to Boris Nemtsov on Moskvoretsky Bridge, at the place where the opposition politician was murdered in February 2015. The site is within spitting distance from the Kremlin, which led to strong suspicions that the latter may have been involved in the assassination. 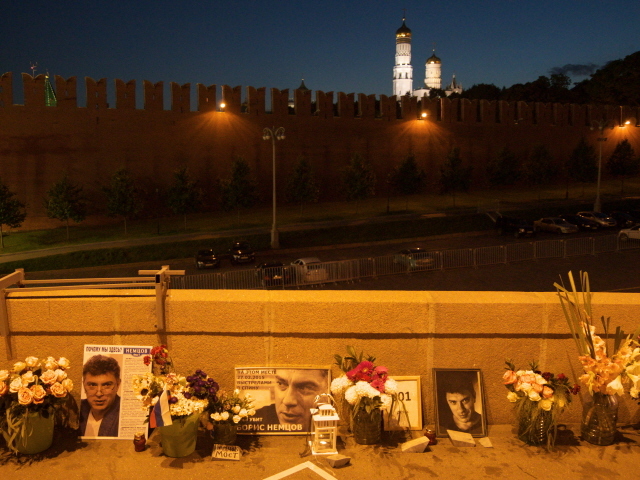 At the spot were Nemtsov was shot, portraits of him, candles, flowers and wreaths are assembled, plus a day count since the incident – when I was there it had been 901 days. Official memorials to victims of contemporary terrorism can also be found in Moscow, which has repeatedly been the target of large-scale acts of terror. One of the most significant is to be found outside Dubrovka theatre that in October 2002 was where the Nord-Ost siege took place. A group of heavily armed terrorists from Chechnya attacked the theatre during a performance of the musical “Nord-Ost” and took the audience of ca. 800-900 hostage. They demanded the end of the Second Chechen War and the withdrawal of all Russian troops, or else they'd kill the hostages. After three days, Russian special forces pumped a chemical gas into the theatre to incapacitate the terrorists and then stormed the building. All terrorists were killed – but some 130 of the hostages also lost their lives due to the gas. Since the security forces wouldn't disclose exactly what chemical agent had been used, the doctors of the medical emergency services treating the unconscious hostages couldn't know exactly what treatment to apply. The heavy-handed and then secretive handling of the hostage crisis by Russia thus attracted severe criticism. Today there is a plaque outside the building itself with a list of the names of the victims of the Nord-Ost siege as well as a monument in the square outside that is dedicated to all victims of terrorism. Two years later the Beslan school siege in southern Russia claimed even more victims (at least 330, half of them children), and again the handling of the crisis by the security forces came under fire. In Moscow there is a small but touching monument to the victims in the district of Kitay Gorod. More positive and uplifting modern developments include the conversion of former Soviet industrial complexes into contemporary cultural centres, such as the former Red October chocolate factory on an island in the Moskva River just south of the Kremlin, or the ArtPlay, Winzavod and Armas centres near the Kursk railway station. The Red October complex stands just behind the awful Peter the Great monument that towers above its surroundings from a small artificial island in front of the main river island. If the designer attempted something so ugly that it is magnificent, then I think you can acknowledge the attempt, but ultimately it failed. The bizarre mega-sculpture looks more like something out of an early Terry Gilliam fantasy movie than like a serious monument. Just north of the Red October island is another post-Soviet development: the Cathedral of Christ the Saviour. This is a new (re-)construction that was begun in the mid-1990s to resurrect a predecessor church demolished by Stalin to make way for a truly gargantuan project. Planned in its stead was a “Palace of the Soviets”, a giant skyscraper with a 100m Lenin statue at the top, but after Stalin's death this never materialized. Instead the hole dug for the foundations was converted into the world's largest open-air swimming pool. Then after the fall of communism, the church resurfaced, got hold of the plot of land, and built today's church, which looks just a little too squeaky clean and artificial to be really convincing, in my view. And I guess lovers of Soviet monumentalism (like myself) deplore the missed chance for that giant Lenin-topped super-Sister, while swimmers will miss that grand pool. Well, you can't please everybody. One other relic from Soviet times does however survive to this day, just across the river: the House on the Embankment used to be a block of modern (for the time) apartments, reserved for privileged Soviet citizens. Today it houses a museum about that time. But unfortunately I missed out on this, as the “House on the Embankment walking tour” that I had booked did not include entering the building in the end (we were turned away), and half the tour was not about the building anyway, but about Soviet (and post-Soviet) history in general. Contrasting with privileged Soviet model citizens was the underground movement of the underprivileged that brought forth a rock music scene that, whilst largely unknown in the West, became quite influential within Russia. Its most revered underground star was Viktor Tsoi – and his image forms the central element of a remembrance wall just off the Old Arbat. It's still a kind of pilgrimage site. Yet Tsoi's his real home was in Leningrad, now St Petersburg, where cover bands still play his band's Kino's material in the Kamchatka live club. A real Muscovite, however, was rebel singer-songwriter and actor Vladimir Vysotsky (1938-1980). His grave, also a pilgrimage site to this day, is to be found in Moscow's Vagankovskoye cemetery. I'm sure there's yet more still that could be of interest to the dark tourist in this huge and varied city, but this is all I can cover here for now. Location: on the Moskva River, right in the heart of European Russia, some 400 miles (600 km) south-east of St Petersburg, a similar distance from its western neighbours Belarus, Ukraine and the Baltic States, and over 800 miles (1400 km) north-west of the Caspian Sea and the Caucasus and similar distance east of the Urals. Access and costs: Easy to get to and around in, though the distances are often great; can be quite expensive. Details: All roads in Russia lead to Moscow, all railroads too and the city boasts not one or two but a whopping three international airports (plus two more for regional and business flights). The main national carrier Aeroflot has its base at Sheremetyevo airport while Domodedevo is used primarily by international airlines especially for long-distance flights, and Vnukovo mostly handles flights from the south and within the CIS area (i.e. the countries of the former USSR). There is plenty of choice and shopping around online can land you tickets to Moscow within the budget-airline bracket (even on non-budget airlines). All three major airports are connected to the city by the Aeroexpress trains – which are a godsend in traffic-congested Moscow. The trains may not be super-cheap but are still by far the best way to get to the centre. Do not even contemplate going all the way by taxi, certainly not to get to the airport, as delays due to traffic can mean you miss your flight even if you allow what elsewhere may be sufficient time! You can also get to Moscow by train, obviously most easily from within Russia especially from St Petersburg to which a very efficient and frequent high-speed rail link operates. But you can also get there on international trains, either via Warsaw in Poland and Minsk in Belarus (for which you'd need a visa! ), or Kiev in Ukraine or via Scandinavia going through Denmark, Sweden and Finland. Direct long-distance trains to the West reach as far as Paris (once a week, but not cheap)! Like London and Paris, Moscow does not have one central station but is served by a ring of stations around the centre, nine in total. Stations for international trains from the West are Belorussky and Kievsky stations, whereas Leningradsky station is the terminus for trains from Petersburg and Helsinki. The famous Trans-Siberian goes from Yaroslavsky station (next to Leningradsky). All major stations are connected with each other by the circle line of the metro, which makes transfers easy. Theoretically you could also get to Moscow by boat or by car – but neither will really be practical options for foreign visitors. A car within Moscow is definitely to be avoided. City traffic is notoriously congested and wild. Don't get involved. Getting around Moscow is greatly facilitated by the excellent metro network. There are currently 12 lines and over 200 stations. These provide by far the fastest transit in this vast city. The metro is also relatively easy to use for foreigners, as most signs are now bilingual in Russian and English. However, the signs telling you which platform to use to get in the one direction or the other were still in Cyrillic only when I was last there (August 2017). Maybe by 2018, for the Football World Cup, the remainder will also be made more foreigner-friendly. You can buy tickets from machines or – still! - from staffed windows. Some windows may have a little “English spoken” sign, so you may want to try those first (though there's no guarantee as to how good the English will actually be). You can get either single tickets (valid for any length of ride as long as you stay within the metro system, with multiple changes allowed) or, if you want to use the metro a lot, buy an electronic ticket that you can top up for as many rides as you like. These are called “Troika”. The ticket as such is cheap enough and fares are discounted by over a third, so it makes sense to get a Troika card even if you only intend to do no more than five rides or so in total. Make sure you know how many rides you have left and if need be top up the card in time. There are also trams, trolleybuses and regular buses, but these will rarely be of much use to most visitors (especially if they do not speak Russian!). There's usually a metro station within walking distance from all points of interest anyway. Do be warned, though, that Moscow does require a lot of walking. Metro stations are often quite far from each other, sites themselves can be vast (e.g. Park Pobedy or VDNKh) and distances you have to walk are aggravated by the fact that it is often near impossible to cross busy avenues and squares so you have to make a detour to find an underpass. Don't try froggering – Moscow drivers take no prisoners. Accommodation options in Moscow are almost endless and cover the full range from budget to super-luxury. The lower end of the scale is a little under-represented perhaps, but the mid-range is well catered for. Planning well ahead and being flexible helps in securing special promotion or discount rates. Some of the cheaper options require a long ride into the centre, but some of them are interesting for their non-central location and even in themselves, e.g. the Hotel Cosmos at the VDNKh and Cosmonautics museum (also close to Ostankino TV Tower). It's a sight in itself: a 1980 Soviet design (VERY Soviet! ), representing what back then was considered 5-star. It isn't that any more by contemporary standards, but it's cheap and quite an experience in itself (if you don't mind a little Soviet-like time-travel, security checks and rough manners included). With regard to food & drink, Moscow has joined the top cities in the world for the breadth of culinary experiences on offer. The choice is mind-boggling – and very often mind-bogglingly good (if you know where to go – do some homework, it really pays off!). But it can get quite expensive. In addition to the old Russian classics, practically all world cuisines are now represented, though you may find that in particular Asian cuisines tend to be toned down in spiciness for the (rather wimpish) Russian palate. But even within Russian cuisine, there are now creative and ambitious places, sourcing regional ingredients and serving them up in unexpectedly innovative and interesting ways. Moreover, you may be able to find specialities from various Russian regions, such as Siberian and/or Arctic delicacies, which you would probably not get anywhere else outside of Russia. If you want a time-travel impression of what a Soviet-era canteen was like (non-smiling staff included), head for the No. 57 Stolovaya inside the southern end of the GUM shopping centre on Red Square. It's self-service, and cheap given the exclusive location, and you can find all manner of classics from the olden days, like “herring in a fur coat” (it is made from pickled herring, finely chopped with hard-boiled egg and gherkins, but the “coat” is shredded beetroot and mayonnaise, nothing actually furry). On the drinks front the best news is that the craft beer scene has rolled over Moscow and there are countless outlets and bars where high-quality local and imported brews are easily available. And don't think Russian craft beers are inferior. They are right up there, absolutely world class, just like in Poland. And the prices, compared with the USA and Western Europe, are still really quite affordable. Wine, in contrast, is often crazily, madly, infuriatingly overpriced in restaurants, while much more affordable in shops. What's supposed to justify the several hundred percent mark-ups I don't know. I'd refuse to pay such prices. Some places, however, offer much more moderately priced 'house wine' by the glass/carafe. Vodka, for the most part, remains cheap, but other, imported spirits can also go for crazy prices. Better stick with non-alcoholic drinks then. Unfortunately Moscow tap water is not necessarily safe to drink; sources vary on this issue, but as a short-term visitor you may want to err on the side of caution. So it'll have to be bottled water. It's overpriced in restaurants too, as you can imagine, but cheap from most shops (except from stalls right at tourist hotspots – avoid these). In summer, you will need lots of water. The continental climate means that while winters can be very cold and harsh, summers can be very hot and sweaty. Do not underestimate this when visiting Moscow in July or August. Time required: longer than you would think, and then some time more. I spent about two weeks in Moscow the last time I was there (August 2017), with a very densely packed, fast-paced itinerary, but not including the Kremlin (as I had been there before – it takes a whole day basically). And I still could have used more time. So to do all that's listed above, plus a few day trips from Moscow (e.g. Monino, Yaroslavl, Gorky Leninskiye), and also have some time for the many non-dark attractions of this grand city, you could easily fill a month! Alternatively be selective and/split it over more than one trip. Combinations with other dark destinations: In general see under Russia. Destinations reachable as day return trips from Moscow include first and foremost Monino and Gorky Leninskiye. Yaroslavl is a bit further away, but is within just a few hours' reach by train too. Perm, also on the Trans-Siberian line, is a bit further away, requiring an overnight aboard the train. Trains to Volgograd take about a whole day, Murmansk a day and a half, so if time is an issue, flying would be the better option to those destinations. St Petersburg, on the other hand, can be reached by an efficient high-speed train service from Moscow that provides a real alternative to flying. Combinations with non-dark destinations: Just where do you begin! In fact I won't even try. There are so many other sources providing info about Moscow's myriad of tourist attractions outside the 'dark' portfolio. So instead I'll just pick out a couple of random things. While the “typical” tourist is usually steered towards old palaces, monasteries and such like, Moscow's modern architecture is certainly worth a look too – some are relics from the Soviet times, others contemporary. 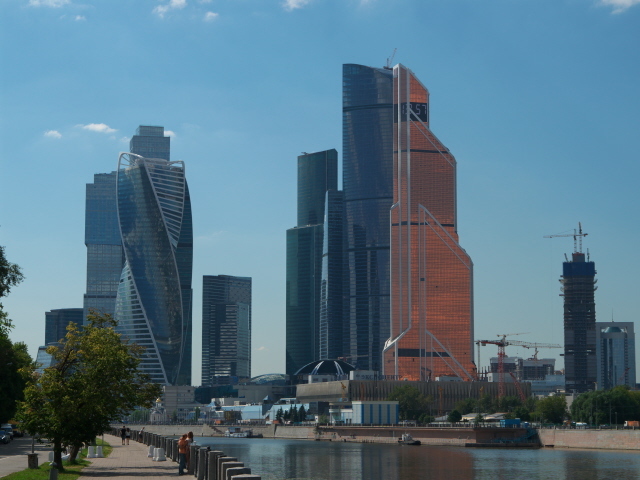 In the latter category, some of the most stunning ensembles of new architecture is the MIBC, the Moscow International Business Centre, a cluster of skyscrapers including the three tallest in Europe. Although shorter, the twisted “Evolution Tower” stands out with its photogenic design. A little gem of non-modernist architecture I'd like to point out is the house with a knot. It's a folly of sorts, a faux-Moorish “castle”, built in 1899 for an eccentric merchant and now housing the House of Friendship with Peoples of Foreign Countries. The interior (which is said to be similarly extravagant) is not accessible to the general public, but the outside is definitely worth a look! Part of the façade's ornamentation is a stucco “rope” that goes all around the building. On the front of the eastern wing, you can find the spot where this rope is “knotted” together, in stonemasonry that is. The most extravagant temple for shopping is the legendary GUM, once the Soviet Union's No. 1 department store, now home to international luxury brands and as such of little interest to (non-rich) tourists, but the interior with its quirky little bridges and Parisian fountain is definitely worth a look.